Imagine your guest’s surprise when the dessert table comes to life! 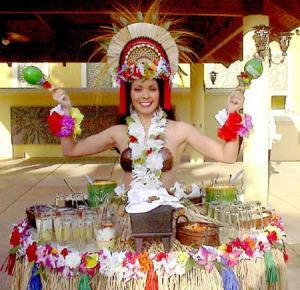 With her body disguised as part of the table our costumed wahini appears as if she is a piece of buffet decor. As guest approach the table for desserts the lovely wahini will gracefully move to and fro pointing out delicious dessert selections. The real fun comes as those who have already been surprised, wait for the next victim to approach the table for their own entertainment pleasure.